Im playing 8 decks, H17, Das sr game. If you don't feel comfortable with the bet spread you have, then simply reduce ROR until you are comfortable. For playing an 8 deck game with 2.5 cut off and minimum bet of $25, is it even possible to have an ROR of under 5% with just a $20k bankroll? Last edited by abc4000; 04-10-2019 at 09:52 PM. Right now you need to learn about and understand the basic fundamentals of how and why card counting works before you start using the software cvcx. Last edited by BoSox; 04-11-2019 at 04:02 AM. Can anyone tell me what the next column "std dev" for? 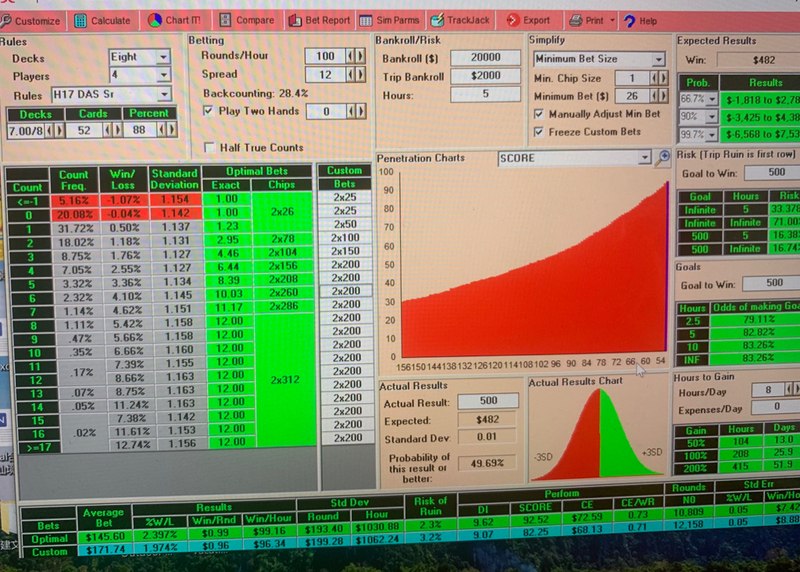 Std dev (standard deviation) is used to calculate SCORE, risk of ruin, optimal bets, swings, etc. Since CVCX performs these calculations for you, you don't really need the number.